Update 3-1-2018 — You’re invited to check out our latest post about 2018 Traditional Decor Trends Influenced by Donald and Melinia Trump’s White House, which is an update of sorts to the following post. While I think the reasoning outlined in the post below is still valid, the newer article has more up-to-date information that is likely to be of interest to you if you want to know more about current decorating trends or traditional decorating. I’ve been researching the latest home design trends for the purpose of compiling trend reports for 2016. One of the things that I keep coming across: statements that the traditional style of decorating is dead, or that 2016 will be the year in which it dies. I get that contemporary style is gaining popularity and gobbling up an increasing market share. No arguments here. I get that there are plenty of modern design enthusiasts, and that there are ever increasing numbers of modern style homes around. Again, no arguments from me on that front. There are 4 reasons I feel confident in declaring that traditional style is not dead as of November 7, 2015. Furthermore, it isn’t going to die out in 2016. If it’s going to die out completely, which I doubt, I think it will take at least ’til the end of this decade for that to happen. But, honestly, I’d be surprised to see it ever die out completely. The World’s Most Famous Home Is Decorated in the Traditional Style, as This Photo Illustrates. 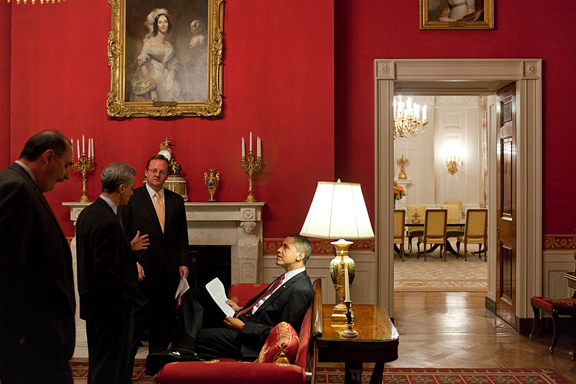 Here You See US President Barack Obama and His Staff in the Traditionally Decorated Red Room at the White House. Let’s not lose sight of the fact that many Americans look to our first family as the ultimate trendsetters. They set the current standards for how we entertain, dress and, of course, decorate. In the recent past, the Obamas have made some interesting updates to the White House décor. However, for the most part they’ve preserved its traditional appeal and formality. Overall the White House is still a traditionally decorated home filled with a treasure trove of spectacular antiques, neoclassical architectural details and traditional style furnishings. It will be interesting to see whether the style of the White House décor will evolve substantially in the future. The Obamas have already made some evolutionary changes; most notably, they have recently updated the White House walls to include some contemporary and modern art, all borrowed from museums. This is significant because the White House’s substantial permanent art collection consists totally of traditional style paintings. Michelle Obama also redecorated the White House family dining room with some modern art and a trendy gray wall color. So we do have at least one transitional style room at the White House; it’s the White House family dining room. The White House Family Dining Room’s New Look After Its Redecoration in 2015 by Michelle Obama. 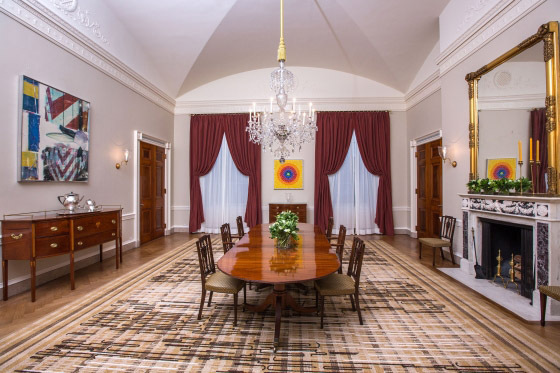 Bill Kloss, an art historian and a former member of the Committee for the Preservation of the White House, said that despite the Obamas’ taste in modern and contemporary art, they “still are trying to keep a sense of formality” in a residence first occupied by President John Adams in 1800. It’s interesting to speculate about the future of the interior décor at the White House. Perhaps by the end of the decade we’ll have a transitional style White House instead of a traditional one. I tend to think not, but it’s certainly a possibility. We may have to wait for the next First Family to move in before we definitively see which direction the home décor of the most famous of family residences will take next. If the next US President and First Lady decide to remodel the White House in the contemporary style, I will have to grudgingly join the chorus proclaiming the traditional decorating style dead. Traditional ended 2014 as the fourth most popular kitchen style, although a quarter of designers will do fewer traditional kitchens in 2015. While decreasing in popularity, it remains a dominant kitchen style with 63 percent of designers reporting that they did at least one traditional kitchen in 2014. Interior design trends come and go, but I can’t think of any time in history when home design trends have reversed themselves within the space of 2 years. They transition gradually from one trend to the next, and it generally takes more like a decade. We had 63% of NKBA kitchen professionals doing traditional kitchens in 2014; I think it would be pretty unlikely for that percentage to be 0% in 2016. Some percentage less than 63%? Yes, that’s likely. That is how things appear to be trending. But 0%? I think not. The Focal Point of This Kitchen Is the Traditionally Styled Victorian Bridge Kitchen Faucet From DVX by American Standard. 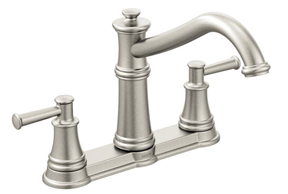 If the traditional style will die in 2016, can someone please explain to me why DVX / American Standard and Moen both recently added brand new traditional style kitchen faucets to their product lines? 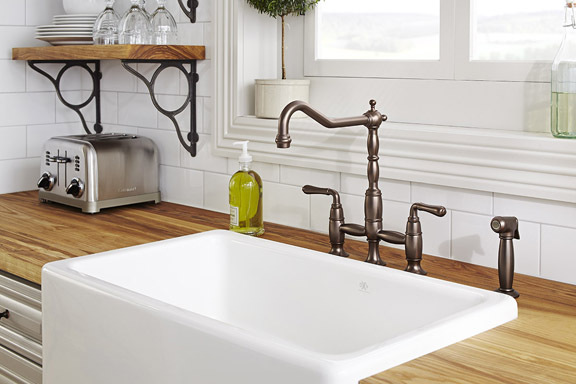 The Belfield Kitchen Faucet by Moen Was Created for Use in Traditional Style Kitchens. It seems to me that there must be quite a bit of current demand for these products in order to justify the product development and marketing costs associated with these releases. Why spend the money on developing a dead style? Oh. Right. Because the traditional style isn’t dead, and won’t be dying any time in 2016! 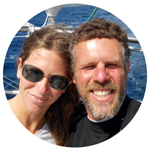 Have you taken a good look around Zillow.com or any comparable real estate website lately? 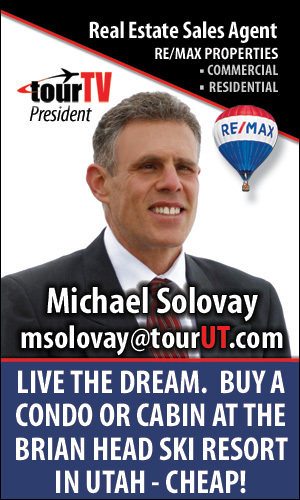 If so, maybe you’ve noticed that there are huge numbers of older homes for sale. Since I specifically enjoy looking at farmhouses built in the late 1800s, I can tell you that there are still plenty of them around. So how should these homes be decorated, if not traditionally? I feel confident in saying that, as long as there are still significant numbers of these older homes around, there’s going to be demand for furnishings that complement them. There will surely come a time in the future, hopefully the distant future, when they cease to exist. That will be a sad day. In the meanwhile, the traditional style may continue dwindling in popularity, but for now I am glad it is not dead.